The surfaces of the landscapes in the Toolik Lake region have been modified by a variety of geomorphological processes including alluviation (movement of material by water), colluviation (movement of material by gravity) and periglacial processes (freezing and permafrost-related phenomena). Many of the surface forms have been described for the Imnavait Creek region (Walker and Walker 1996). 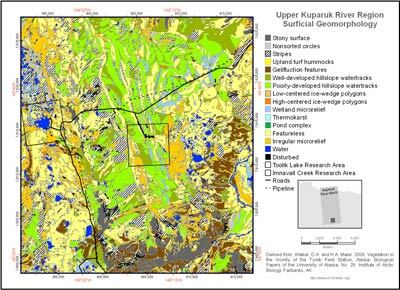 Common surficial geomorphological features within the mapped area include sorted and nonsorted circles (frost boils), turf hummocks, gelifluction lobes and terraces, water tracks, high- and low-centered ice-wedge polygons, wetland features (strangmoor, aligned hummocks, palsas) and thermokarst features.